The 2013 reboot of Tomb Raider introduced a new level of open-world exploration to the series. However, Rise of the Tomb Raider will take player freedom to a whole new level. Besides Lara’s story which is really exciting, we’re really thrilled to talk about the new scale that we have for Rise of the Tomb Raider. Our exploration spaces are 3 times larger than they were in the last game and our tombs are much bigger. And we’re employing what we call “A Nested Puzzle Approach” that means there are multiple puzzles that all work together to solve 1 big puzzle. We also introduced new traversal mechanics, like Lara can climb trees and can swim underwater and can use that not only for traversal but as a way too subtly approach an enemy and take them out from above or from below. What's more, you won't encounter any loading screens in the world. The only time you'll encounter one is if you die or start up the game for the first time. That's great news. One of my favorite parts of The Witcher 3 was how players could enter a building or ride several miles without seeing a single loading screen. It made exploration a lot more enjoyable. We've come a long way from the days of Baldur's Gate, when players had to swap in a new CD every time they traveled to a different region. I'm curious whether seamless game worlds are a new standard that developers will hold to. Are we seeing the end of loading screens? Or will they come back once developers find ways to make their virtual landscapes more complex? 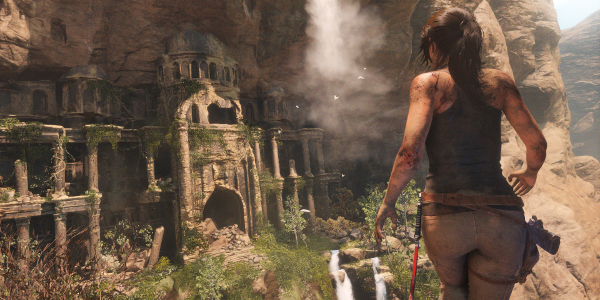 In Rise of the Tomb Raider, Lara Croft has become a globe-trotting explorer. Her latest adventure eventually takes her to Siberia to find the ancient city of Kitze, so she can uncover the secret of immortality. Along the way, she'll face off against a shadowy global organization and violent animals. Presumably she'll run into some kind of supernatural hocus-pocus in the third act as well. Rise of the Tomb Raider will debut on November 10th exclusively for Xbox One and Xbox 360. PS4, PS3 and PC gamers will get their chance to play it sometime in 2016.